Magnetism for kids is something I could probably explore for month here on Babble Dabble Do, but you might get a little bored…or would you? Simply put the magic of magnets is a sure winner with kids every.single.time. Even adults go bonkers for magnets! They are hands down the most interesting metal out there, provided you are a nerd like me. If you are like most of the world you might argue that GOLD is the most interesting metal out there…but I digress…. FIRST AND FOREMOST BEFORE WE GET STARTED, A WORD OF CAUTION: Magnets should never ever be ingested. Ever. Any magnet that is sized small enough to fit into a child’s mouth should only be used with adult supervision, or better yet, not used. When working with magnets and kids err on the side of caution and use big honking magnets that are not choking hazards please! See more info on the Tips section below. Also note that nuts and bolts are choking hazards so please supervise when trying this project with kids! Okay now that I might have scared you a bit let’s get back to the fun shall we? Today’s project is a simple way to illustrate the power of magnetic force. It’s a really straightforward project that uses magnets to build a sculpture and hold it together. It’s a fascinating way to literally experiment with how strong magnets are and how much they can and cannot hold. Ready, set, go! 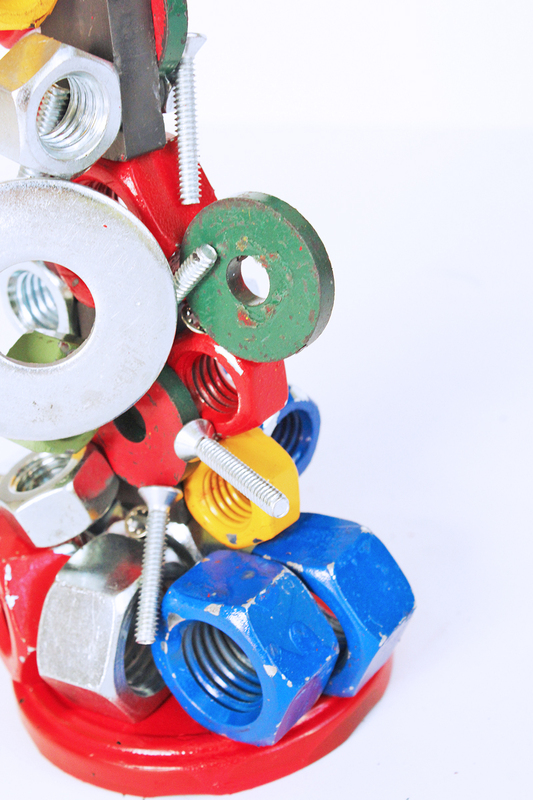 Nuts and Bolts- Medium to large nuts are fun. Flat head bolts work best. Ceramic magnets like these and these. Hardware stores often carry these as well. I can order these online and pick up at my local Ace Hardware. Step One If you are painting these the first thing to do is prime and paint as many nuts and bolts as you like. You may also want to prime/paint your metal lids. 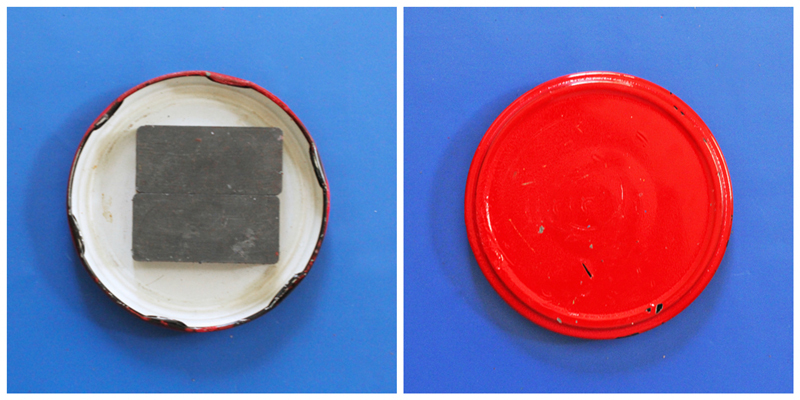 Step Two Start by placing two ceramic magnets on the underside of a large recycled metal lid. Turn the lid over and add nuts and bolts on top of the lid to build a structure. Step Three Once you feel the magnetism dissipating add another ceramic magnet in the structure and continue to build. Step Four Expand the structure to the sides. Test out how far you can get the magnetism to hold the metal parts in place. Step Five Take it apart and repeat! What do you think, fun? Keep this together as a set and next time you have dinner guests break it out and build a little sculpture together! My kids built some of the sculptures below and so did my designer friend who was visiting for the day. MAGNETS ARE A CHOKING HAZARD AND WORSE! Magnets are one of the few items that when swallowed may need surgical removal. If you have a child who even stands the remote chance of putting a magnet in their mouth please save this activity until they are older. Alternatively complete adult supervision is required for this activity. To make it safer we used large industrial sized magnets rather than small neodymium magnets which are just too tiny and tempting for little ones to put in their mouth. After priming and painting our nuts I can’t say I recommend this step. The paint just doesn’t adhere well to the metal. It did add a lovely splash of color which was enticing to my kids but be prepared for lots of chipped paint! Ceramic magnets can pinch when they are drawn together! Try and have the magnets either stuck together or separated on the work table a good distance so you don’t get an accidental pinch as they zoom together. Ceramic magnets can chip. When they chip a sharp shard may break off. Again, adult supervision of this activity is recommended. If a magnets chips or breaks remove it from the play. Large nuts are heavy! They are really fun to use but when they fall they fall hard. Do this project on large table to prevent the nuts from falling on your toes! Tom Shannon. Tom Shannon is an artist who uses science in his work to create magical pieces of art. His sculptures harness the power of magnetism to float and hover gently in space. Check out this Anti Gravity Sculpture on TED Talks. Another artist who uses magnetism to create wonderful kinetic sculptures is Laurent Debraux. I’m just getting familiar with his work but it’s just fascinating to watch. Check out videos of it here. Exploring magnetism with kids can be creative! 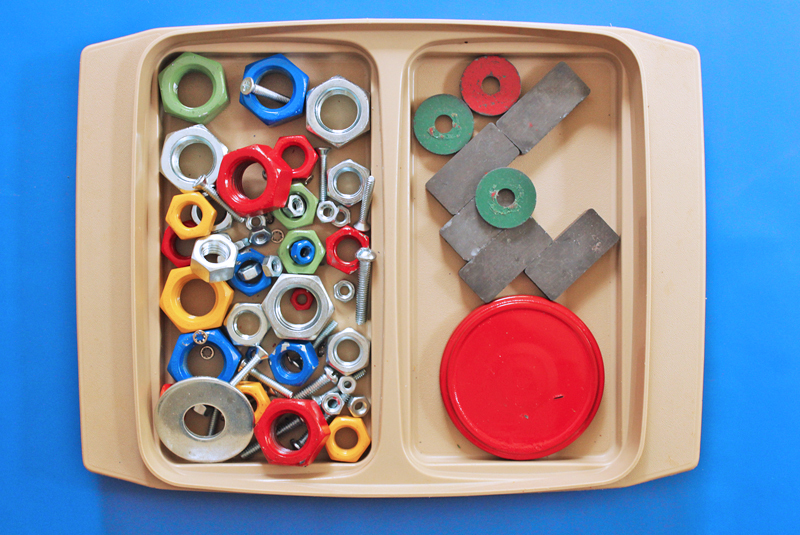 Magnets are a fascinating tactile experience for kids. You need to hold them and manipulate them and feel the magnetism or repulsion. This magnetic sculpture is all about testing the power of magnetism. 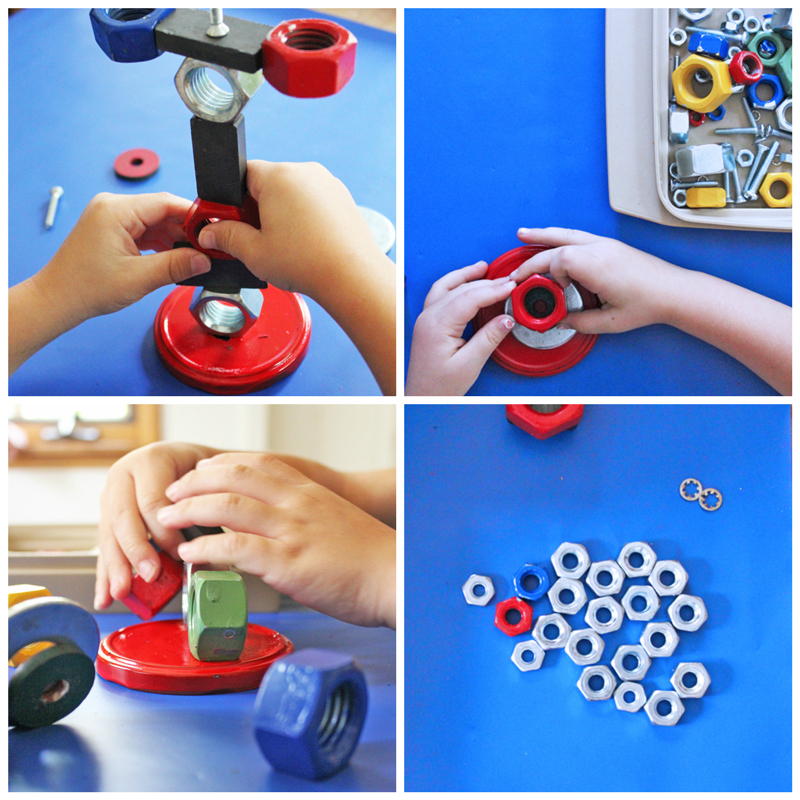 If you enjoyed making a magnetic sculpture check out our bouncing magnet project. It was inspired my grandfather who loved to make scientific gadgets. We’re far from the holidays but this is another fave magnetic project of ours Tin Can Christmas Trees; decorate and redecorate them with magnetic do dads. If you have a magnetic white board Picklebums has 3 really cool magnetic activities for kids to try. Cool Magnet Man is an entire website devoted to magnetism complete with scientific explanations and experiments to try. Learn more about the science behind magnets and where the word magnet comes from at the Kahn Academy ! 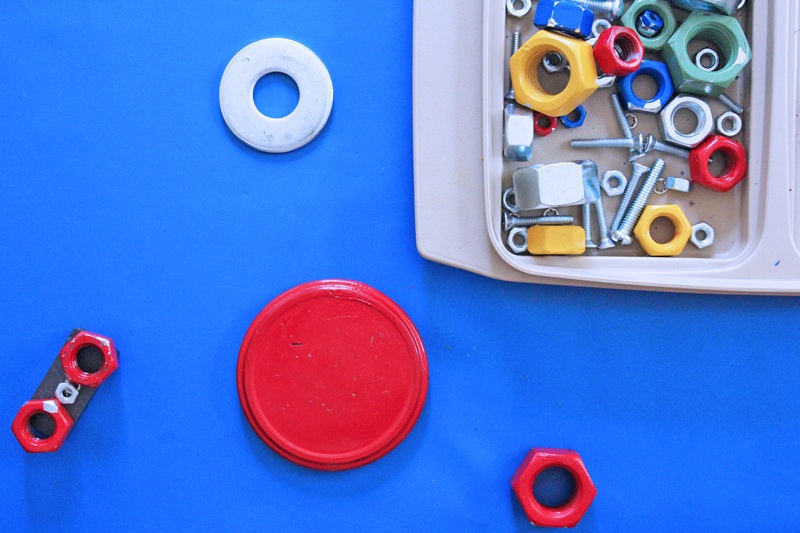 Magnetic toys are a perennial favorite our home. Check out a few recommendations here. And don’t miss out on more scientific art here on Babble Dabble Do! Your child’s inner Tom Shannon thanks you! Subscribe below or like us on FB! I’d also love to see you all on Pinterest! I need to put together a set for my son. This looks like such fun! They are fun! You can also raid your leftover bolts and do-dads stash, if you have one like me! I wonder if Rustoleum spray paint would work better(?) The colors make this so much more fun. I used Rust-o-leium. I think the issue is that the bolts are made of pretty smooth metal and with all the clinking of the magnets the paint had a hard time staying put. Still the main color showed it was just a little chipped. I’m not an expert spray painter though so there me a better way to do it. I have a patience problem with paint drying times…. ;) Ha! Oh my, does this ever look fun. I want to play with it too! Yes you will not be able to keep from playing with them!! This is such a fun idea!! I think my kids would absolutely love to make some of these on their own! Looks like I know what I’ll have to start prepping for Christmas! I would love it if you linked up with our weekly party! I totally see this as something that would be featured! Thanks Randi! They would make fun DIY gifts! Thanks Leyla! I love discovering and talking about amazing artists and creators 🙂 Love your blog BTW!!!! I’m wild about this. We’re going to make these! They are a lot of fun Gina! This is so wonderful! I will definitely be sharing this on http://www.thegrade3teacher.com. I love your website.